A few months ago, we had a guy come out to give us a quote on our foundation problem. At the time, I thought he was so nice and helpful. He told us his company’s solutions would be overkill for our problem, and I just needed a general contractor. We didn’t get any more estimates at the time because weren’t sure how to proceed. I couldn’t imagine why the guy wouldn’t have been honest with us. Paul then pointed out something. “It could be that the job was too small for them.” That was a valid reason, and gave me the motivation to make the necessary calls and schedule estimates. So, I called 3 other companies and have estimates this and next week. The first one was today, and it was discouraging. The far right of the wall goes to a closet at the back of our carport. Next to it is the dining room, and on the far left of that level is the kitchen. Underneath all those is a crawlspace. Here is basically what I was told today. The back half of the main level of our house has sunk about 3 inches (measuring inside the house). The main culprit is the foundation wall in the back corner (see picture above). The guy wasn’t positive – he wanted to show it to a structural engineer – but he was pretty sure that the wall can’t be fixed, and would need to be replaced. 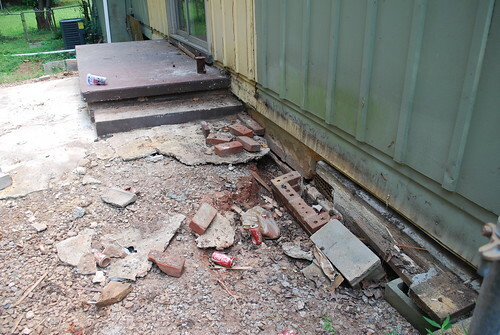 This is just the foundation wall that runs along the back of the closet by the carport. Once replaced, about 6 helical piles would be needed to jack up the house to its correct position. Unfortunately, part of the carport floor will need to be removed to put the piles in. I was also told there is a lot of water damage in the crawlspace, which may have been caused or worsened by the floods from last year (a year ago, it rained heavily for 8 days straight). If that’s true, then that would explain why the estimate that we got 14 months ago didn’t reflect this extent of damage. He also said something about waterproofing the entire crawlspace and putting in a sump pump. He showed me pictures of how the ground is all eroded under there. I asked him for ballpark estimate, and he said it would be more than $10,000 and probably less than $20,000. He will get a more specific estimate back to me in the next few days. Whew, this is a lot to take in and we’ll need to figure out what to do. We obviously don’t have the cash on hand for that, and it concerns me to wait too long to deal with this problem – saving up $10-20,000 will be very difficult to do quickly. I am eager to hear what the other two engineering companies have to say, to see how their estimates compare. This entry was posted in foundation, issues, our house. Bookmark the permalink.